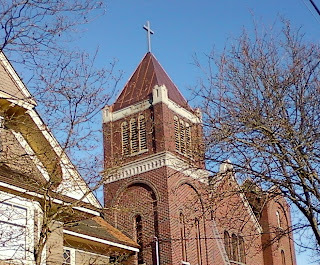 In this era of metal theft and high copper prices, it’s wonderful to see the new copper steeple atop the St. Francis of Assisi Church on Napier at Semlin. The church dates from 1938; Franciscan monks had used the grand old house adjoining it as a monastery beginning about 1924. The monastery evolved into a chapel and became the focus of a Catholic parish in the 1930s and, post war, was one of the draws for Vancouver’s Italian community settling into Grandview. The old house itself, facing Semlin Street, was built in 1908 for an Australian real-estate speculator named William Miller; his brother J.J., the founder of the PNE, built the Queen Anne house called “Kurrajong” at Napier and Salsbury, two blocks to the west.